Spend time transforming tiles, broken crockery, stone, granite and other materials into a mosaic you can treasure for your home or garden. 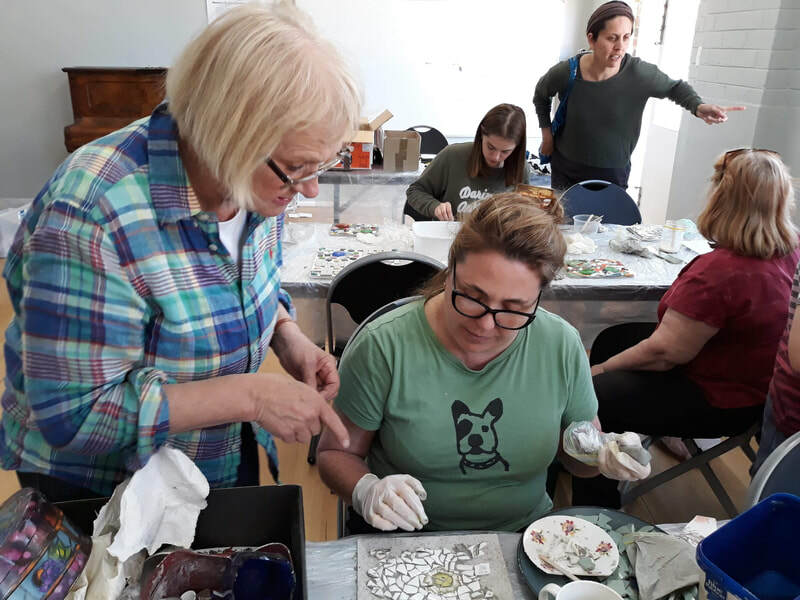 These sessions are held in my studio in Macleod and provide an introduction to the picassiette style of making mosaics. This is a cost-effective, sustainable and creative way to salvage items that would otherwise be discarded. Mosaics can be made by all kinds of people and no experience is necessary. Even children as young as five years old can assemble and glue pieces onto wood or a tile to make something colourful and joyful. Many people find the process of making mosaics very relaxing and meditative and time just slips away. $50 per session including materials and refreshments. Max. 5 children per session. Discounts for groups of two or more. Please call Amanda to discuss details. 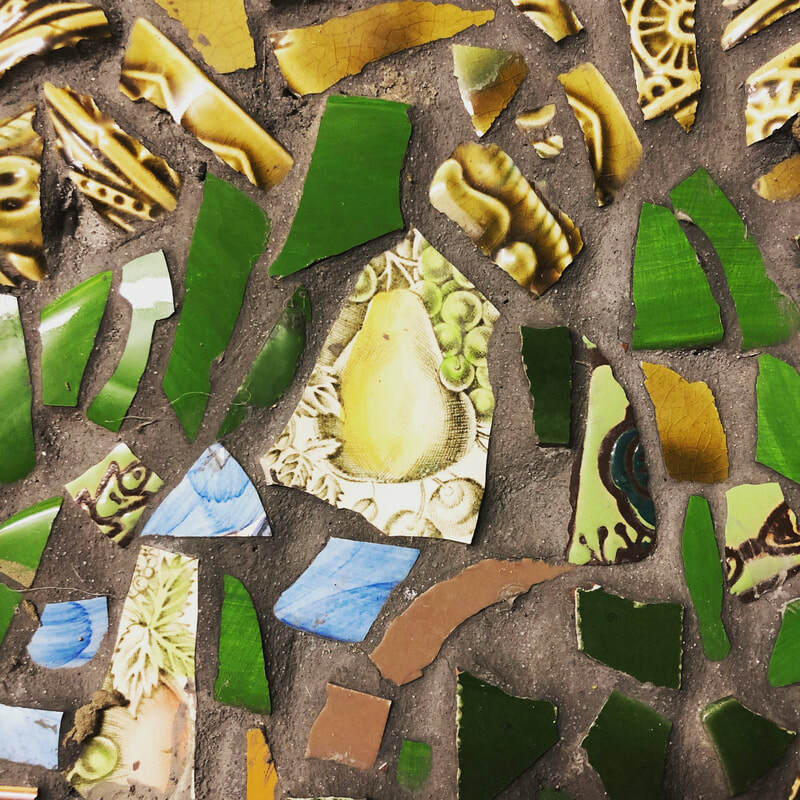 These sessions aim to give you an introduction to the basics of mosaics, to get your brain and hands working to make patterns in a relaxing and supportive environment. Upcycled crockery, tiles, glass and other items. People work at different paces, depending on whether they have already contemplated and drawn up what they would like to make. Some may finish their piece in one workshop. Others will need a follow-up session to complete their work. Grouting, if needed, is done at least 24 hours afterwards. One-on-one mosaic or grouting session - by appointment. Enthusiasm and a willingness to learn. If you have an old cup, plate or other item you would like to include in your mosaic, please bring this along. Wear solid shoes, and comfortable clothing. Optional items: apron, rags, water bottle. To secure your spot in a workshop, payment is due one week before the workshop date. A 25% cancellation fee will be charged if you cancel within a week and can't come another time. Please register your interest for other workshops via the contact form or call Amanda 0413 997 467.